Working with a sewing machine that doesn’t operate well can be an extremely frustrating experience. If you want to get an uninterrupted and smooth performance from your sewing machine, it is critical that you clean and oil it every once in a while. No matter how high-quality your sewing machine is, it won’t last long without regular maintenance. Proper maintenance of a sewing machine helps it perform better and enhances its shelf life. Not only that, but it prevents the machine from breaking down. All parts of the machine should be kept well-lubricated to improve its performance. Consider a machine that is more than 10 years old and has never been oiled or service. Chances are that the old lubricants in the machine have dried up and gotten hard. There are machines whose lubricants become so hard and discolored that even the wheel cannot be manually turned. It happens more often than one might think. In such machines, the old lubricants must be removed. If they have hardened too much, then chemicals must be used to clean them. If hardened lubricants aren’t removed, then they will cause further issues as particles of grease may lodge into the working parts of the machine. They can lead to expensive and extensive repairs. 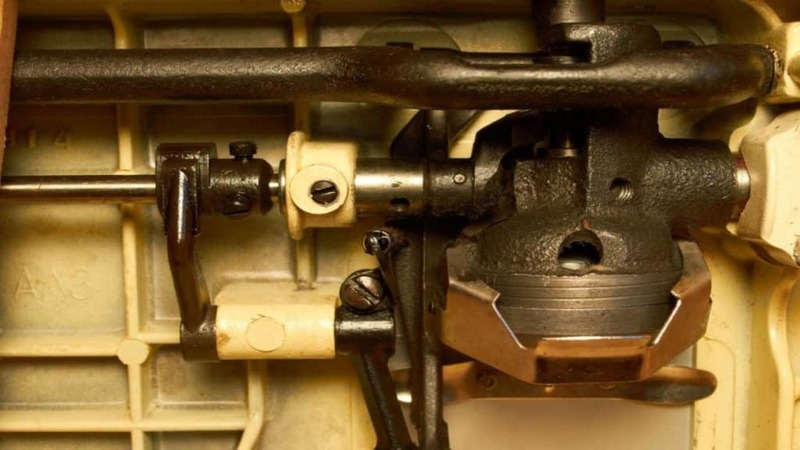 Many novice sewers don’t understand how they can oil their sewing machine to keep the parts well-lubricated. They struggle to get the oil into the right places of the machine and often ask experts about how to oil a sewing machine. If you are having a hard time oiling your machine, read on as we will show you how to oil a sewing machine. But, before that, we’ll share some essential information about sewing machine oil. For lubrication of sewing machines, people use sewing machine oil. When used correctly, this oil enhances not only the performance of a sewing machine but also its shelf life. Sewing machine oil works on both home use sewing machines and industrial sewing machines. This oil was originally created from natural lubricants like petroleum products. However, now there are several sewing machines oils available in the market, which are made from artificial ingredients. The ingredients that are used to make sewing machine oil come from petroleum products called petrochemical. These lubricants are composed of ingredients and minerals found in the crude oil. They are widely used as industrial lubricants and also in the home. However, excessive exposure to the sewing machine oil made from petroleum products is inadvisable. If you are using sewing machine oil, you should make sure that it doesn’t come in contact with your eyes and skin. Different domestic and natural lubricants are often used as oils for sewing machine. Products like silicone, coconut and olive oils that are commonly found in the home may be used as sewing machine oil or blended with other ingredients to create a good alternative to the sewing machine oil made from petroleum products. These sewing machines oils are relatively inexpensive, which allows you to regularly use them for oiling your machine. If you aren’t sure about these oils, it’s best to lubricate only a few parts of your sewing machine first and see how well they respond to the oil. If they don’t cause any unwanted effect, you may use them for oiling your sewing machine. However, we recommend you to use the sewing machine oil made from petroleum products or the manufacturer’s recommended oil (if any) as it gives better results. The ingredients that are used for making industrial sewing machine oil are similar to the lubricants we use for home sewing machines. But, many of them are composed of heavy minerals and harsh ingredients that can have a harmful effect on the environment and humans. Many industrial sewing machine oils contain paraffin, Teflon and other harmful chemicals which is why they should not be used in home sewing machines. There are certain things you must consider before you begin the oiling process. 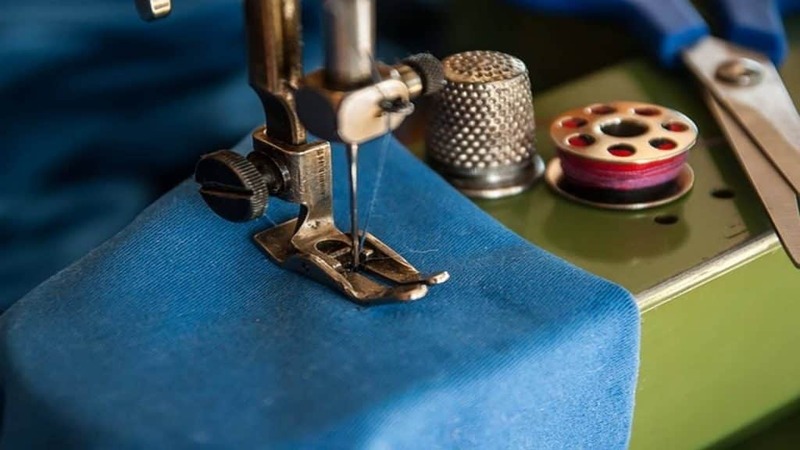 Before starting, research the ingredients you plan to use as oil for sewing machines and determine all the steps you need to take to get your sewing machine ready for lubrication. You will have to clean your sewing machine and get the equipment and tools you would need to oil the machine. One of the most important things to note is that you should always consult your sewing machine’s manual for cleaning and oiling as many models come with unique warnings and instructions. If you aren’t careful, you may accidentally damage your sewing machine. If you have lost your user manual, check online for it on your sewing machine’s manufacturer website. The first step is to gather the tools you would need for cleaning and oiling the machine. For cleaning the sewing machine, use soft fabrics, stiff brushes like toothbrushes and dust cleaners. You must be able to reach small spaces inside of the machine without damaging them, which is why these items are a good pick. For lubrication, we recommend using the manufacturer’s recommended sewing machine oil or one that is made from petroleum products. The second step is to clean the sewing machine. If you don’t clean the machine before oiling, there won’t be any point of lubricating the machine as all the dust will get into the parts of the machine and damage. In order to clean the machine, the first thing you need to do is remove all additional machine materials and parts so that they don’t get in the way. First, disconnect your machine from the power source. Then, remove the needle, hooks, excess thread, and stitching plate. Then use a can of compressed air to blow away lint and dust from inside your sewing machine. All small pieces of debris and dirt should be removed as they can mix with oil and stay behind. When using air to blow away dirt, make sure to keep the can at a distance of about 15 cm from the machine components you want to clean. The can should be kept at such an angle that the dirt and debris blow away from your sewing machine. Use a small piece of dust cloth or soft fabric to clean the larger spaces and surface of the machine. You can use a damp piece of cloth to remove dirt on the surface of the machine. Once you have properly cleaned your sewing machine and removed the dirt and debris, the next step is to oil the machine. When you are applying oil to your sewing machine, make sure to only use a few drops on every part. If the oil is used excessively, it can actually slow down the machine components and make it difficult for you to sew efficiently. Put some drops of sewing machine oil into all moving parts of the machine. You might not know which parts of the machine should be lubricated. So, consider this – if a part rubs against another machine part while the sewing machine is operational, it should be lubricated. If you accidentally drop more than a few drops into a moving part, then quickly use a cloth to rub it away very gently and carefully. Put some drops of sewing machine oil inside your machine’s hook race to oil its shuttle. This part of the machine is round and allows the bobbin hook of the machine to fit into one place. When this area is lubricated, the small parts won’t rub together and the machine will not easily wear out. When you are lubricating each individual part, manually move them after dropping a few drops of oil to ensure that the oil is evenly distributed and spread. Once you have lubricated the machine and the oil has dried off, reassemble the machine. Re-install all the parts including the needle, hooks and stitching plate. It is important to note that not all sewing machines require oiling, especially some of the newer machines as they are self-lubricating. The parts of newer machines are made with oiling injected into them. Therefore, read the instruction manual of your machine to determine whether oiling is recommended for it or not. However, some top-of-the-line, expensive sewing machines do require occasional lubrication even though the manual does not state that they are needed. 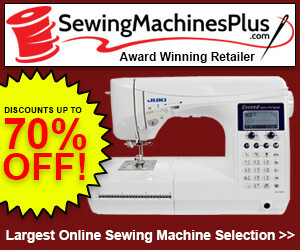 Some sewing machine manufacturers recommend their own sewing machine oils. During the warranty period, you should use the sewing machine lubricant that is recommended by the manufacturer. If you don’t, the manufacturer may refuse warranty coverage on the basis of the fact that a particular brand of sewing machine oil was used to lubricate the machine. After the expiration of the warranty period, you can use any other sewing machine oil that works fine with your machine. If you are not sure about how to go about oiling a certain sewing machine, follow the instructions on the user manual. There may be a guide on cleaning, repairs or lubrication, which would make the whole process easier for you. If your manual states that the sewing machine should not be lubricated, then you should never oil your machine. Only disassemble a few parts of your machine at a time. If you disassemble all the parts at once, you will complicate the process and it will be hard for you reassemble the machine. Regularly clean and lubricate your machine to ensure that it continues to perform efficiently. If you want to increase the shelf life of your sewing machine and ensure its efficient operation, clean and oil your sewing machine regularly. If you don’t oil your sewing machine regularly, you won’t be able to sew properly and complete your important projects on time. Sewing machine oils made from various ingredients and minerals can be used for lubricating a sewing machine. However, if you are lubricating your sewing machine during the warranty period, then use the manufacturer’s recommended oil. If the manufacturer doesn’t recommend specific oil, use any oil that suits your sewing machine. Before oiling the machine, properly clean it with a small piece of cloth and toothbrushes so that dust doesn’t mix with the oil and get into the machine parts. Follow the user manual for instructions on how to go about cleaning and oiling. Make sure to drop only a few parts on each moving part of the machine and if you drop excess oil, remove it with a piece of cloth. We hope that you now understand how to oil a sewing machine. The process isn’t too complicated and although you may struggle to oil your machine the first time, you will get a hang of it after a couple of tries. However, if you think that you can’t oil the machine yourself or find the process too complicated, then let a professional do the job for you. They will be able to clean and oil your sewing machine properly without damaging any critical part of the machine.